I may be talking at Digital Citizens next week. I say may because they have some good speakers & I talk too much anyway. However there are three issues about personality, privacy, identity, disclosure & all that gubbins that I want note down here regardless. About 18 months ago, I did a session with some public servants where I gave them some hypothetical social software situations and asked them what they would do. What struck me about their responses (esp. to the first situation) was the sheer diversity. Everything from “institute disciplinary action against my staffer” to “tell the complainer to go **** themselves”. Now some of you will nod and say “this is simply reinforces the need for a clear social media policy”. Well yes, but this assumes that there is a consensus concerning what is good & bad in terms of online behaviour. Which brings me to the gentleman on the left. As anyone who has watched Curb Your Enthusiasm will know, much of the humour arises because Larry and the people he meets in his life disagree over what is acceptable and unacceptable behaviour. Is it acceptable to try more than 10 flavors of ice cream in the shop? Is it OK to call a man a c***? What do you do if your housekeeper can’t keep her chest in check? How do you react if someone gives your wife a bra as a present? How much caviar can you eat at a party? We live in a diverse , dynamic society so we cannot rely on tacit norms. The internet increases the diversity of the people we can meet & interactive with. On the one hand, this is great. Our lives are much richer because of it. But on the other, we are presented with more opportunities for misunderstanding. How much should we each disclose online? What is acceptable behaviour? And above all, who gets to choose? Now some of you will already have an answer to question 1. “Online behaviour should be covered by the contract you have with your employer”. Well, yes, but when is someone working and when are they off duty? We all have to juggle multiple roles and identities in our lives. As I write this, I am keeping an eye on my young son (whose motor skills development is both a joy and a worry). I am trying to juggle blogging and fatherhood. I suspect this juggling of our identities is becoming more complicated and conflicted, rather than less. Our relationships with our employers have become ever more intense (and frankly sadomasochistic). “Yes of course you can have a promotion/time off but you must keep this mobile device switched on 24/7”. As more balls get added, the more likely we are to drop one. It’s always been a handy myth that we only have one identity. Social software doesn’t change that, it simply makes it more visible. Who exactly am I talking to? Who are you right now? The item on the right is called a Johari Window. It’s a simple way of framing how identity and reputation operate. Much of the discussion about personality and disclosure has focused on what people choose to move from “Hidden” to “Public”, which is an important discussion to have but not the only one possible. The internet can also be seen as a great tool for self discovery – if you have many other people watching and commenting then what opportunities do you have for discovering your blind spots? What opportunities do you have for exploring your unconscious? I’d like to ask Marcus Brown that, if he ever gets off the toilet*. Most conversations about personality and disclosure tend to focus on the risks, the downsides. What are the upsides? What do these new communications technologies allow us to do that we haven’t done before? 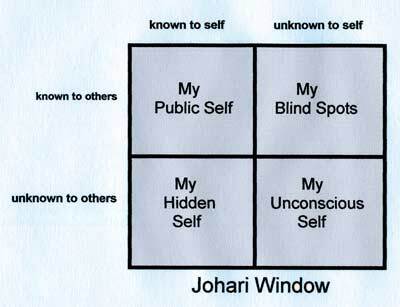 My only beef with the Johari Window is that its nice, regular, square shape does not adequately represent our messy, multiple, changeable personalities. It should look more like a weird, pulsing blob. *Whenever I sit on the toilet for too long, I get pins and needles in my legs. I try to stand up and then fall over. Ooops – was that too much disclosure? This entry was posted in Presentations & Events and tagged personality identity disclosure. Bookmark the permalink. Cool. Interesting how social software has given the Johari Window a whole new life. I heard about it in the 70s, then it seemed to hibernate until just the last year or two… Or maybe that indicates what my reading patterns have been over the years!